Soon available in an ebook format. Stay tuned. If you have trouble ordering it online let me know so I can let you know when it is available. You can flourish with a life of fruitfulness, faith, and joy. 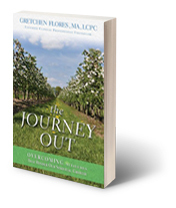 The Journey Out is about moving out of the “weeds” that choke our faith and into a life of fruitfulness. Based on the Parable of the Sower where the good seeds fall among the thorns, the book will challenge you to move beyond stagnancy and routine to growth in relationship with God. By removing harmful attitudes and replacing them with fruits of the Spirit and character traits that foster real relationship and authenticity, you will find the freedom to flourish unhindered. The author, inspired by her own relationship with God, shares her journey out of the weed patch and into deeper relationship with the Master Gardener. This book focuses on developing the character traits of patience, trust, compassion, and gratitude, among others, in the context of relationship with God. It also addresses the issues of anger, worry, perfectionism, haste, and other similar “weeds” that can prevent us from growing in our journey with God. Once we experience newfound freedom, the result is a life of fruitfulness and a harvest unimpeded by attitudes that hold us back.